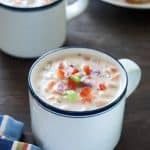 Vegetable and White Bean Chowder - all the flavors you love of a traditional clam chowder but made vegetarian friendly!! In a dutch oven or large soup pot cook the bacon over medium high heat until browned and crisp. Add 1 Tablespoon butter to the pot. Return pot to medium high heat and add the onions, celery, carrots, and red bell pepper. Saute until vegetables are softened – about 3 minutes. Increase heat to high and add the sherry – scraping up any browned bits on the bottom of the pan. Cook until almost all the sherry has evaporated – about 4 minutes. Reduce the heat to medium and sprinkle flour and thyme over the vegetables. Stir and cook for 1 – 2 minutes. Add the vegetable stock, stirring and scraping the bottom of the pan. Increase heat to high and bring soup to a boil. Reduce heat to medium and simmer the soup for about 4 minutes. Add the beans, bacon and the milk or half and half. Garnish with additional minced vegetables or fresh thyme if desired.